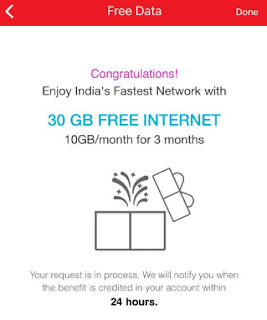 Airtel Monsoon Surprise Offer 30GB Free Internet Data Loot Offer, Airtel Monsoon Offer Free Internet for 3 Months, Free Internet for Airtel Postpaid Users – After so many time i am here with Airtel Free Interntet Offer. Airtel has come up with new Airtel Monsoon Offer Loot. Previously we Shared Airtel Holi Offer. Now Airtel is here with Airtel Monsoon Surprise Offer. You will get Free 30GB 3G/4G Internet Data for 3 Months. This offer is valid for Airtel Postpaid users. Yes if you are the Airtel Postpaid user then now you will get 30GB 4G Internet Data absolutely free. Just download MyAirtel app & Get your Free 30GB Free Internet Data. This is just amazing and super loot offer for all. This Monsoon get 30GB 4G or 3G Data in your Airtel Number & Enjoy unlimited internet for 3 months. This is amazing loot offer from Airtel. 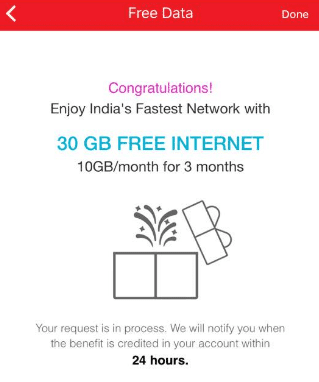 So hurry up activate Airtel Monsoon Offer and Get Free 30GB 3G/4G Data for 3 Months. NOTE : Offer is Valid from 1st July to 30th September 2017. NOTE : Airtel Monson Surprise Offer is valid only for Airtel Postpaid Users. You can activate from My Airtel app. Enter Mobile Number & Verify via OTP. In Home Page you will get Banner about Free Data. Claim your Free 30GB 4G Internet Data. Finally you will get Free 30GB 4G/3G Data for 3 Month (10GB Per Month). Enjoy Unlimited 3G/4G Internet Data in your Airtel Number for 3 Months. 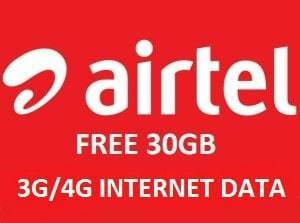 Get 30 GB Free Internet Data for Airtel Postpaid Users. You will 10GB/Month for 3 Months. You can Claim your Airtel Monsoon Surprise Offer on My Airtel app after 1st July, 2017.